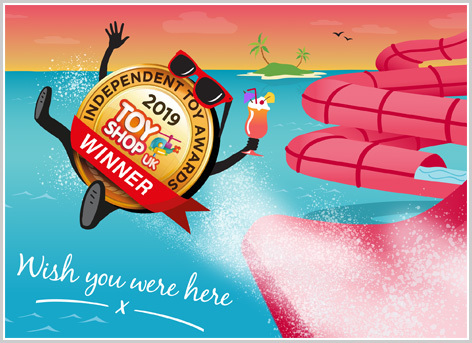 Now celebrating our 11th year, the Independent Toy Awards enjoy unrivalled respect within the industry, thanks to being voted for - not by "experts", "testers" or "panels" - but by those at the sharpest end of the industry... the nation's independent toy retailers. 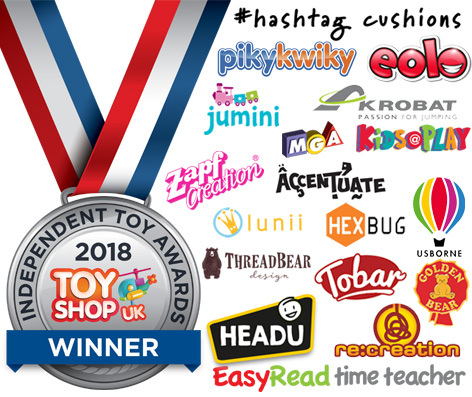 We are uniquely positioned to host such awards due to our ever-growing network of over 900 independent toy retailers that list themselves on this website for free. Do larger companies have a bigger chance of winning? No! The wholly democratic entry and voting process ensures that the typically eclectic list of winners is made up of all kinds of companies... from household name behemoths to fledgling start-ups. How do the awards work in practice? Suppliers are invited to submit their hero products to any of the numerous categories and the products with the most votes win either a gold, silver or bronze medal logo. Products that narrowly miss out on a top spot but achieve at least 10% of the votes in their respective category are awarded a commendation medal logo. Being online-only, our awards are run without the huge expense of an official ceremony and this is reflected in the fact that it costs just £125/product/category to enter. We enjoy substantial trade coverage and promote it heavily to our websites visitors, newsletter subscribers and social media followers. In addition, many suppliers capitalise on their win - not just by displaying their winning medal on websites, packaging and trade stands - but also by their own marketing activities. 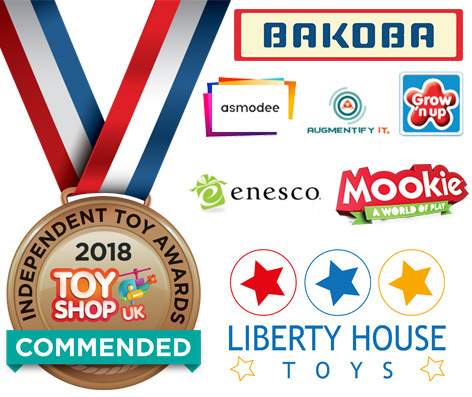 To be a gold medal winner in the Independent Toy Awards, you need to not only have a first-class product but be well respected and trusted within the independent toy trade. A large number of products that won silver were so close to a gold medal that a vote or two either way would have tipped the balance. As well as household name companies, you'll notice a generous smattering of lesser known companies too, which just goes to show how our awards aren't about marketing muscle... they're about having a great product. The quality of the products submitted by the following bronze medalists only goes to show how closely fought our awards were this year. The companies below narrowly missed out on a top three medal this year, but acheived at least 10% of the votes in their respective categories. We are thrilled with the GOLD award win for our Geomag Confetti Line. The independent sector is a critical channel for us and to be recognised in these awards is a great honour. Toy shop UK do a fantastic job managing these independent focussed awards and it’s a delight to add a further gold award to our portfolio. We are thrilled to win Gold in the Puzzle category for our Schleich: A Day at the Farm Puzzle and Play set. The quality of Schleich puzzles really speaks for itself and we are delighted that this has been recognised! From the beginning, over two years ago when we first had talks with Warner Bros. in London, then Burbank in the U.S., we set the innovation goals high. Our approach was to ‘do Wow! or not at all’. These awards are a result of the belief that Warner’s showed in us. I’m as happy for them and their teams as I am for Wow! Stuff and our teams. 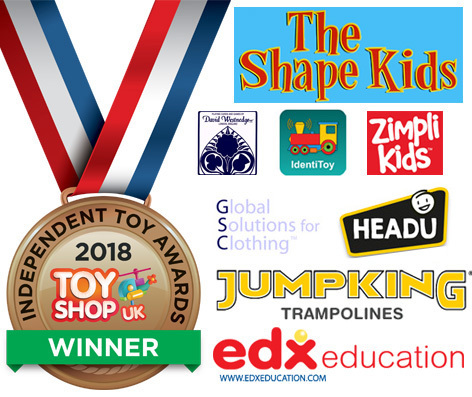 We' are bsolutely delighted to have been awarded Gold in the 2018 Independent Toy Awards. The receipt of this award will further cement the place of this puzzle range within the educational sector. We are thrilled and proud to have won this Gold award. It makes us feel successful in our continued dedication towards promoting imaginative play and interaction amongst children. I am delighted to receive the Gold Award for our Unicorn Scooter, thank you very much - it’s always great to win awards and is a recognition of the work that went into designing this great scooter. It has proved to be extremely popular and why not? Its fun, it lights up and it has Unicorns! It’s a brilliant product. Our wooden Popcorn Machine won the Gold medal in the Role Play category, it is fantastic! We are over the moon thank you so much." We are honoured to have taken the Gold Medal. The PLAYMOBIL 911 GT3 Cup allows children as young as 4 to experience some of the excitement of track racing – and clearly the judges agree. We’re very proud to have been recognised by the Independent Toy Awards. Abbsolutely delighted with our win! Every Year we endeavour to bring new and exciting games to our product categories, in 2018 more than ever! We are over the moon with this award for Jungle Runners, that recognises the quality and play value of our products but still staying true to our goal of bringing people together. We are proud to bring smiles to faces of kids and adults alike. Thanks to our retailers and customers for choosing Plushland and helping us bring cuddly friends to people all over the world! We're so excited Laser Battle has won 2018's GOLD medal for the electronic category. We've worked hard creating a toy that engages kids and gets them outside, playing with their friends and family. Every feature of this laser tag gaming set was carefully considered for it's fun factor and it's paid off. It feels great to be recognised with this award by Toy Shop UK! We’re honored to receive the GOLD medal at the 2018 Independent Toy Awards for our Race to 10. We will carry this award with pride and as a seal of the importance, benefits and joy to mix education and play! Many thanks to the 2018 Independent Toy Awards! We are delighted to have received gold for SMASHERS in the collectibles category. 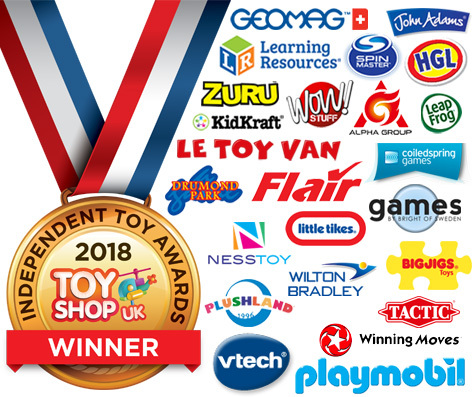 The independent sector is one that is important to ZURU, each year we aim to bring new and exciting products to the market and we’re proud that this has been recognised by the Independent Toy Awards.